Professionally written, well-detailed, pet sitting service agreement catered to your business services. Stand out in front of your competition!! Show your clients you are running a professional and organized business! Full page of policies and procedures related specifically to the pet sitting industry covering areas such as many liability issues, cancellation policy, bad check policy, payment policy, and so much more. 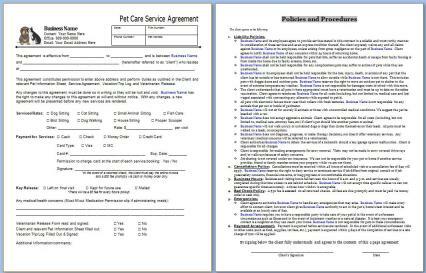 This 2 page contract goes perfectly with all the other forms offered in the pet sitting package. It is designed to ensure your clients are not entering the same information more than once. Order with confidence from an experienced pet sitter.